PPI Global - Fastmarkets RISI - Objective Insight. Better Decisions. Staying on top of worldwide pulp and paper markets has never been easier. 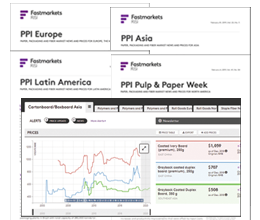 With Fastmarkets RISI’s PPI Global service, you’ll get all the news and prices covered in Fastmarkets RISI’s industry newsletters PPI Pulp & Paper Week, PPI Europe, PPI Asia and PPI Latin America in one convenient source — with the added value of new content and features that are impossible to deliver in a print newsletter.